Citation: Bening VE. On the asymptotic behavior of the deficiency of some statistical estimators based on samples with random sizes.. J Appl Math Statist Appl. 2018;2(1):32-41. Estimator, Risk function, Deficiency, Asymptotic deficiency, Sample with random size, Asymptotic expansions, Poisson distribution, Binomial distribution, Three-point distribution. In most cases related to the analysis of experimental data, the number of random factors which influence observed objects is random and changes from one observation to anorher. Due to the stochastic character of the intensities of information flows in high performance information systems, the size of data available for the statistical analysis can be often regarded as random. In classical problems of mathematical statistics, the size of the available sample, i. e., the number of available observations, is traditionally assumed to be deterministic. In the asymptotic settings it plays the role of infinitely increasing known parameter. At the same time, in practice very often the data to be analyzed is collected or registered during a certain period of time and the flow of informative events each of which brings a next observation forms a random point process. Therefore, the number of available observations is unknown till the end of the process of their registration and also must be treated as a (random) observation. For example, this is so in insurance statistics where during different accounting periods different numbers of insurance events (insurance claims or insurance contracts) occur and in high performance information systems where due to the stochastic character of the intensities of information flows, the size of data available for the statistical analysis can be often regarded as random. Say, the statistical algorithms applied in high-frequency financial applications must take into consideration that the number of events in a limit order book during a time unit essentially depends on the intensity of order flows. Moreover, contemporary statistical procedures of insurance and financial mathematics do take this circumstance into consideration as one of possible ways of dealing with heavy tails. However, in other fields such as medical statistics or quality control this approach has not become conventional yet although the number of patients with a certain disease varies from month to month due to seasonal factors or from year to year due to some epidemic reasons and the number of failed items varies from lot to lot. In these cases the number of available observations as well as the observations themselves are unknown beforehand and should be treated as random to avoid underestimation of risks or error probabilities. In asymptotic settings, statistics constructed from samples with random sizes are special cases of random sequences with random indices. 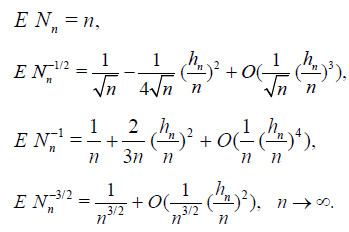 The randomness of indices usually leads to that the limit distributions for the corresponding random sequences are heavy-tailed even in the situations where the distributions of non-randomly indexed random sequences are asymptotically normal [1-3]. For example, if a statistic which is asymptotically normal in the traditional sense, is constructed on the basis of a sample with random size having negative binomial distribution, then instead of the expected normal law, the Student distribution with power-type decreasing heavy tails appears as an asymptotic law for this statistic [1,4]. At the same time, according to the conventional logics of the statistical analysis, the distributions of the statistics (estimators, tests, etc.) to be used for the statistical inference should be known before the actual sample is observed in order to calculate critical values or thresholds. As a rule, asymptotic approximations by limit distributions of statistics are used instead of the exact distributions because the former are considerably easier computable than the latter. As this is so, in limit theorems of probability theory and mathematical statistics the centering and normalization of random variables are used to obtain non-trivial asymptotic distributions. It should be especially noted that to obtain reasonable approximation to the distribution of the basic random variables, both centering and normalizing values should be non-random. Otherwise the approximate distribution becomes random itself and, say, the problem of evaluation of quantiles required for the calculation of critical values or confidence intervals becomes senseless. Throughout the paper we use conventional notation: is the set of real numbers, is the set of natural numbers, h(n) ~ f(n), n → ∞ if and only if . The symbols ,⇒ and denote the coincidence of distributions, convergence in distribution and the end of the proof, respectively. for each θ ϵ Θ. The following statement describes the change of the limit law of an asymptotically normal statistic when the sample size is replaced by a r.v. (Theorem 3.3.2) . Before turning to the general case of statistics constructed from samples with random size, that is the main aim of the present paper, let us recall the notion of a deficiency of a statistical estimator for the traditional case where the sample size is nonrandom . Suppose that for n → ∞, the ratio n / m(n) tends to a limit b, the asymptotic relative efficiency of Tn (X1,…, Xn) with respect to Tn* (X1,…, Xn) . If 0 < b< 1, we have dn ~ (b-1 - 1) n and further asymptotic information about dn is not particularly revealing. On the other hand, if b=1, the asymptotic behavior of dn, which may now be varying from o(1) to o(n), does provide important additional information. If limn n →∞dn exists, it is called the asymptotic deficiency of Tn with respect to Tn* and denoted d. At points where no confusion is likely, we shall simply call d the deficiency of Tn with respect to Tn*. A useful property of deficiencies is the following (transitivity): if a third estimator is given, for which the risk also has an expansion of the form (1.5), the deficiency d of with respect to Tn* satisfies the relation d = d1+ d2, where d1 is the deficiency of Tn* with respect to Tn and d2 is the deficiency of Tn with respect to Tn*. The situation where s = 1 seems to be the most interesting one. Hodges and Lehmann  demonstrate the use of deficiency in a number of simple examples for which this is the case (for testing problems see also [7-10]). The purpose of this paper is to present some means for the comparison of the quality of estimators constructed from samples with random sizes with that of estimators constructed from samples with non-random sizes. As this means we propose to use the deficiency. It can be an illustrative characteristic of a possible loss of the accuracy of statistical inference if a randomsize- sample is erroneously regarded as a sample with nonrandom size. The present paper develops the research started  and presents a number of applications of the deficiency concept in problems of point estimation in the case when the number of observations is random. Section 2 contains main results. First, in Section 2.1 we heuristically show that if the d.f. Q(x) in Lemma 1.1 is not degenerate, then the deficiency of a statistic constructed from a sample with random size whose expectation equals n with respect to the same statistic constructed as if the sample size was non-random and equal to n, grows almost linearly as n grows. A non-trivial behavior of the deficiency is possible only if the random sample size is asymptotically degenerate. This is the case considered in Sections 2.3, 2.4 and 2.5 where the deficiencies of statistics constructed from samples whose sizes have the Poisson, binomial and special three-point distributions, respectively, are considered. Section 2.2 contains some preliminary basic results dealing with some properties of estimators based on the samples with random sizes. Sections 3 - 5 contain results concerning deficiencies of asymptotic quantiles. In this paper we focus on the case where the sample size is independent of the r.v.’s forming the sample. This assumption, first, is made for the sake of simplicity of the methods used to obtain the qualitative results. Second, in many applied problems this assumption does not contradict the essence of the problem. For example, this is so when the data is accumulated within a prescribed time interval (a month, a year, etc. ), but the informative events form a stochastic flow. This situation is typical for financial and insurance practice or any other field of activities with accounting periods. Moreover, the independence of X1, X2,… is not crucial since basic Lemma 1.1 can be proved without this assumption . Third, most papers considering non-independent sample sizes deal with the case of asymptotically degenerate indexes. This is just the case yielding non-trivial results in the present paper. 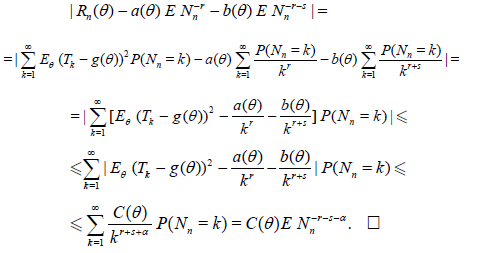 It seems that using martingale techniques or imposing some concrete conditions on the character of dependence between the sample elements and the sample size, the results of this paper can be extended for the non-independent case. This assumption will enable us, instead of comparing random variables, to compare their easily tractable parameters. D = E U−1 −1. in probability as n → ∞. This property is inherent in sample sizes with the Poisson, binomial and special three-point distributions considered in the present paper. It is worth noting that an example of geometrically distributed Nn for which the limit r.v. U as the exponential distribution vividly illustrates the possibility of the deficiency to be unbounded since in this case the Fréchet distribution of the r.v. U-1 has the infinite first moment. Summarizing the abovesaid we conclude that if the d.f. Q(x) in Lemma 1.1 is not degenerate, then the deficiency of a statistic constructed from a sample with random size whose expectation equals n with respect to the same statistic constructed as if the sample size was non-random and equal to n, grows almost linearly as n grows. A non-trivial behavior of the deficiency is possible only if the random sample size is asymptotically degenerate. This is the case to be considered in the present paper. Assume that for each n ≥ 1 the r.v. Nn takes only natural values (i.e., ) and is independent of the sequence X1, X2,… Everywhere in what follows the r.v.’s X1, X2,… are assumed independent and identically distributed with distribution depending on . that is, the expected sample size equals the sample size for the case where it is non-random, that is, the r.v. Nn is parameterized by its expectation n.
with Tn defined in (2.1). If γ ≠ -1, this estimator is not unbiased but may have a less expected squared error than the unbiased estimator with γ = -1. One easily obtains (3.6) . When the deficiencies of statistical estimators constructed from samples of random size and the corresponding estimators constructed from samples of non-random size n (under the condition ENn = n) are evaluated, we actually compare the expected size m(n) of a random sample with n by means of the quantity dn = m(n) - n and its limit value. We will now apply the results of Section 2.2 to the three examples. We begin with the case of the Poisson-distributed sample size. Let Mn be the Poisson r.v. with parameter n – 1, n ≥ 2, i.e. One can therefore save an expected 3 / 2 observations by using the biased estimator (0) . The best value of γ in the normal case is γ = 1 for which and which therefore provides an additional saving 1 / 2 observations. These examples illustrate the following statement. The proof follows from Theorem 2.1, (1.6) and (1.7). 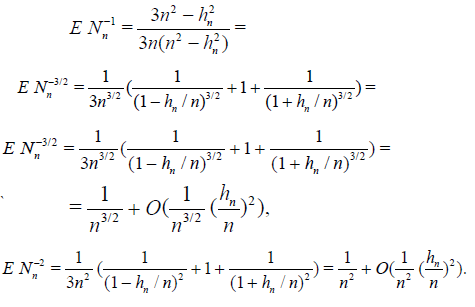 In this Section the results obtained above will be applied to the calculation of the deficiencies of the estimators Tn , , (see (2.1), (2.4) and (2.7)) constructed from samples whose sizes are random and have the binomial distribution. Using the definition of the binomial distribution we directly obtain the following statement. Lemma 2.1 and relations (2.3), (2.6) and (2.9) yield the following result. that is, hn = o(n) as n → ∞. It is easy to see that (2.12) and (2.13 imply that Nn / n → 1 in probability as n → ∞. The asymptotic formulas for and are established in a similar way. This Lemma and formulas (2.3), (2.6) and (2.9) directly imply the following statement. It is worth noting that in Corollary 2.3 h can be arbitrarily large. Therefore the finite asymptotic deficiency d considered in Corollary 2.3 can be arbitrarily large. This is in full correspondence with the conclusion of Section 2.1. Where, G(cα) = 1 - α. Now we apply these results to our exapmle. Carrying out the type of computation outlined above we arrive at the following simplified version of Lemma 1.1 (see (3.11)). where uα = Ф-1(1 – α) denotes the upper α – point of the standard normal distribution. that is, the r.v. Nn is parametrized by its expectation n.
Now assume that the d.f. of the non-normalized statistic Hn admits an asymptotic expansion described by the following condition. The proof is a simple exercise on the application of the formula of total probability. 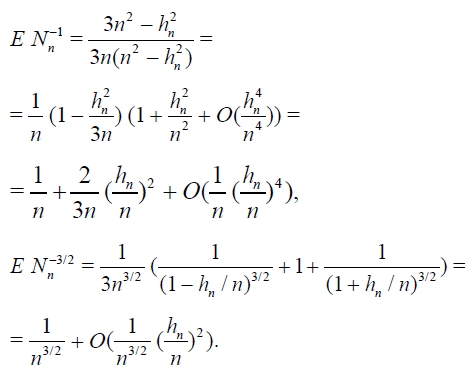 After these preliminaries (see (4.5) and Lemma 4.2), the following Lemma can be formulated. where Ф(uα) = 1 - α.
where G(cα) = 1 - α. The result of these steps is the following Lemma. The proof for the other cases are similar and left to the reader. Carrying out the type of computation outlined above we arrive at the following simplified version of Lemma 4.1. The result of these Lemmas is the following Theorem. In the paper we consider asymptotic deficiencies of some estimators based on the samples with random sizes. It can be illustrative characteristic of a possible loss of the accuracy of statistical inference if a random-size-sample is erroneously regarded as a sample with non-random size. Some basic results dealing with some properties of estimators based on the samples with random sizes are also presented. The research is supported by the Russian Foundation for Basic Research, Project 18-07-00252.